If you find yourself lacking office space, but expanding your existing footprint isn’t an option, you may want to consider a modular building by Panel Built. What is a modular office? Where do you get one? Specifically built for flexible use, Panel Built’s modular office provides a safe, quiet inplant office for staff and visitors. It is easy to install, extremely durable, and provides a clean, well-lit temperature controlled workplace in an environment that may otherwise be uncomfortable or uninhabitable for employees. 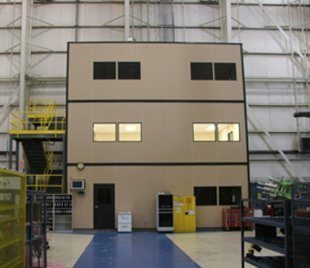 In manufacturing plants, clean-rooms, industrial buildings, warehouses and other similar facilities, a modular office can provide the perfect escape from the work and noise when you need it most. When you’re in an industrial facility, the work floor can be uncomfortable for employees, or even downright dangerous. It’s humane to have a place for your employees to gather, to rest, to eat, and to socialize when breaking from the job. Many times this space isn’t available in the existing footprint of the building, so a modular office is perfect to get the job done. It’s temperature controlled, so employees will surely be comfortable in there if working conditions aren’t. Some plants and facilities operate in extreme heat, so the cool air available plentifully in a modular office is a relief for employees! A modular office negates the obligation for a supervisor to walk the floor to check on employees. An office with windows perched on a mezzanine might overlook an entire floor, so a supervisor can get some work done while keeping a close eye on his employees and their productivity. Supervisors simply don’t have time to peruse the work floor, assess productivity, complete paperwork, communicate with contractors and clients, and meet with employees, so any assistance helps. The modular office makes all of this doable from one spot, without ever requiring a supervisor step foot outside of his office door. There are many different facets to every operation – there’s usually an intensive mixture of manual labor workers, people managers, and office workers who all combine their abilities to keep an operation up and running successfully. In many cases, these people aren’t all in the same place, but sometimes they should be. An office accountant may be more efficient with his job if he has a better understanding of the product his company makes, how it’s made, and how it sells. For that reason, many companies have found it beneficial to keep vital office positions in the same work environment as other functioning parts of the company that they otherwise wouldn’t be around. A modular office is the perfect way to do this – to incorporate office jobs in with other job types. An inplant modular office would be great quarters for Human Resources, accounting, or marketing, for example. Much is required within industrial plants and facilities – there’s all sorts of equipment, tools, paperwork and other location specific items lying around that need to find a home. What better place to store location specific items than a centrally located modular office in the facility itself? Storing items in an office will allow you to maintain one specific central location for all items that need a space for storage, so you’ll never wonder where you put it last. In addition, since modular offices are temperature controlled, you can rest assured that even the most sensitive of materials are in an environment that’s safe and healthy. Lastly, we know there are several items you prefer to keep under lock and key. Keeping a modular office in the plant is a great way to lock up those items that don’t need to be laying around in the off time. Want to create a little more space? Put your modular office up on a mezzanine… you’ve added square footage for storage underneath the office that you would never have otherwise had! 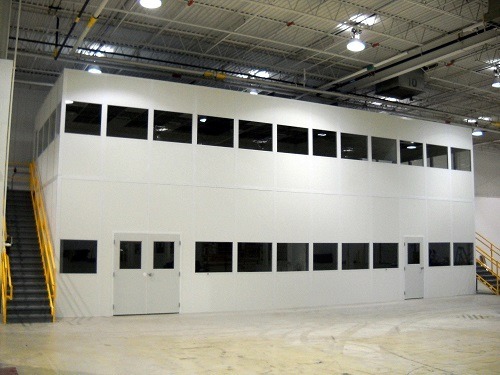 Panel Built modular offices are the perfect solution to most any office need within a facility or plant! Use it for a break room, put a supervisor in there, make it a place for storage, or group a few desks together and make it a generalized work space for office employees. One thing is for sure- when you consider the quality, price, and customer service you’ll get with Panel Built… you’ll be glad you went with us!